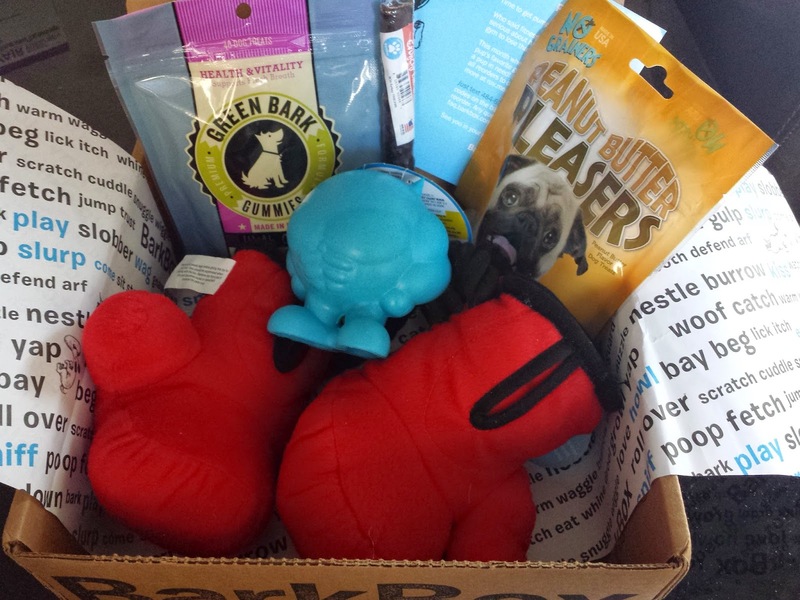 Pint-sized and Simple: BarkBox(es) Unboxing - April 2015 + Get A Free Box! 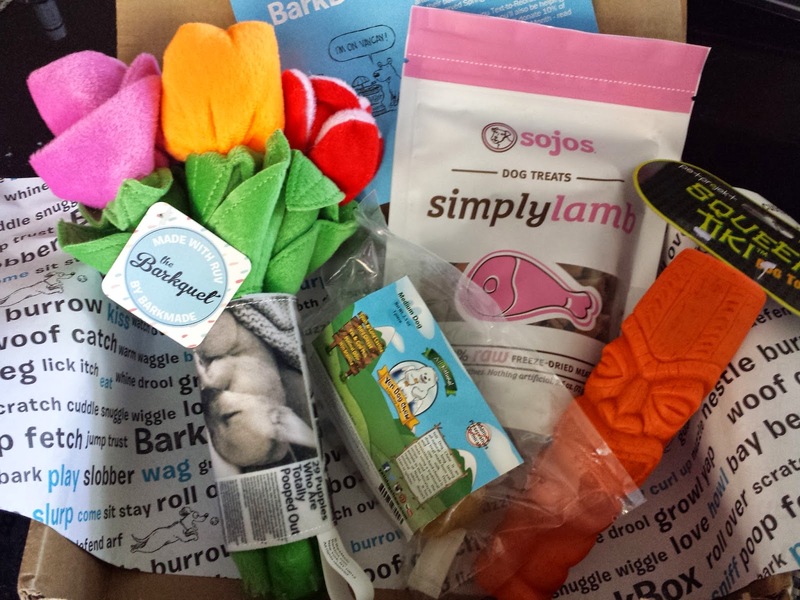 BarkBox(es) Unboxing - April 2015 + Get A Free Box! I'm kind of overwhelmed with dog boxes right now (but in a good way! ), so I'm going to squish two of them into one post. My lucky canines got THREE BOXES IN ONE DAY and now they are BFFs with the mailman. Two of those were BarkBoxes. Why two boxes? 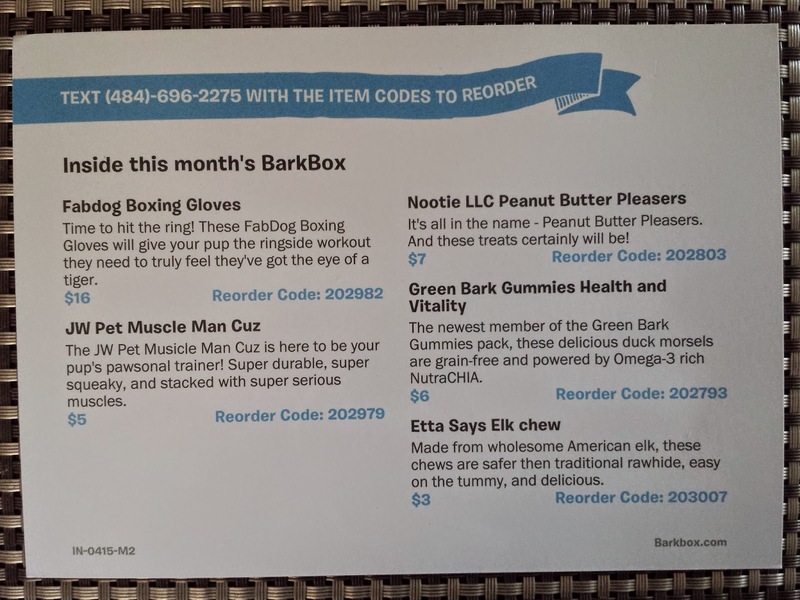 Last month BarkBox had a huge sale during which you could get something like 40% off a new subscription. Since we're outside of the contiguous 48 we normally pay $5 shipping per box, or an extra $30 per 6-month plan (there's also a 12-month one if you can afford the cost upfront). During this sale, however, I'd be able to pick up another 6-month sub + pay shipping and it'd still come out cheaper than a "regular" 6-month subscription. SO WHY NOT?! I thought. Since the sale would end before the next billing cycle I'd be getting the next month's box. 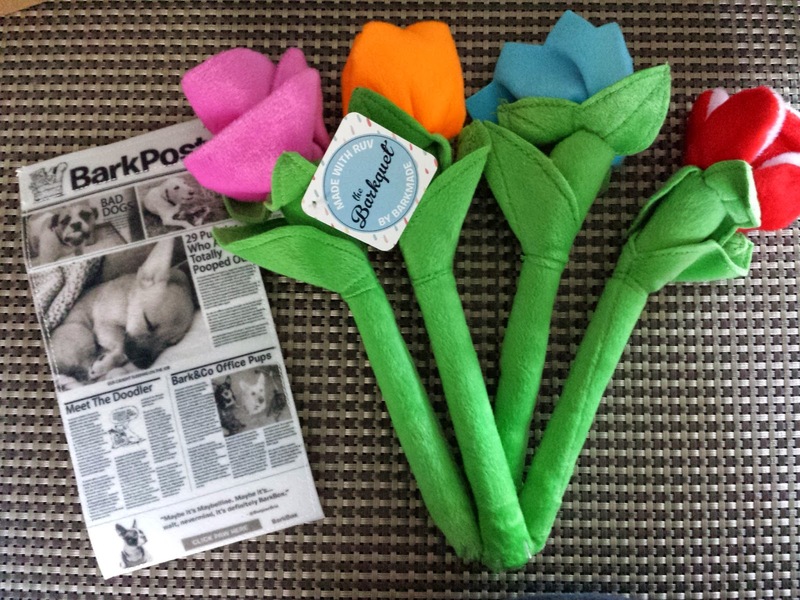 And so here we are with two BarkBoxes in April. I don't know about you, but I have a fat dog. Corgis are notorious for packing on the weight and then having the hardest time losing it. Case in point: Our vet said Macho's overweight. So over the past year he's been chasing Pebbles around the yard for an hour each day. Nonstop. (where does all that energy come from??) We cut back on his food so he only eats one cup per day (no table food). Plus we switched to a healthier food with less filler and more substance. At his last vet visit he lost a whopping 2 lbs since last year. Womp womp. My poor chubby corgi. Then when I saw April's Fitness theme I thought it was hilarious and immediately rubbed it in Big Boy's face. 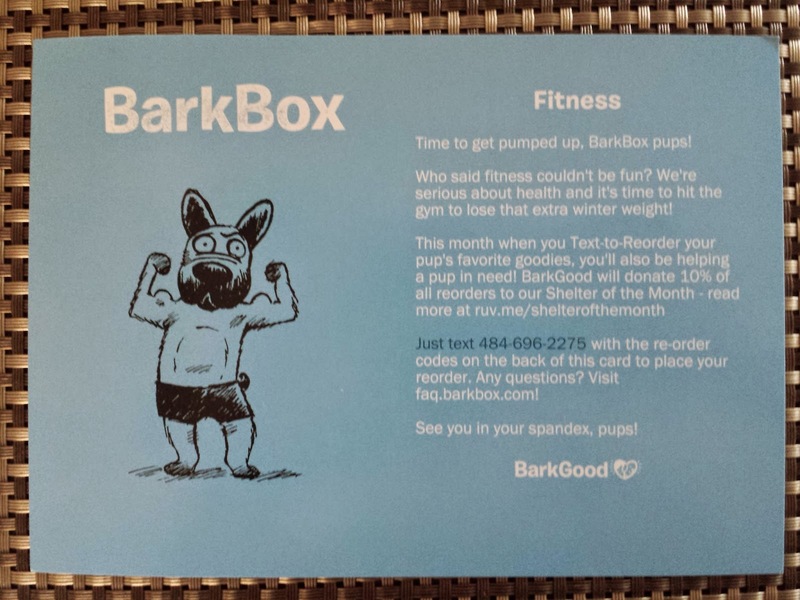 This month when you re-order items in your box, 10% of proceeds will go toward BarkGood's Shelter of the Month. April's shelter is Downtown Dog Rescue located in Pasadena, CA. Looks like they've rescued lots of pitties...they're such cuties! JW Pet Bad Muscles Cuz (Value: $5) - Aww, Macho gets his own personal trainer! This is made out of thick rubber that will no doubt withstand Macho's jaws. The Little One, I'm not so sure. If it lasts a week with her then I'd call it a success. The only downside is that this toy reeks of oil or something petroleum-based. It'll definitely need to meet my dishwasher before it meets the dogs. 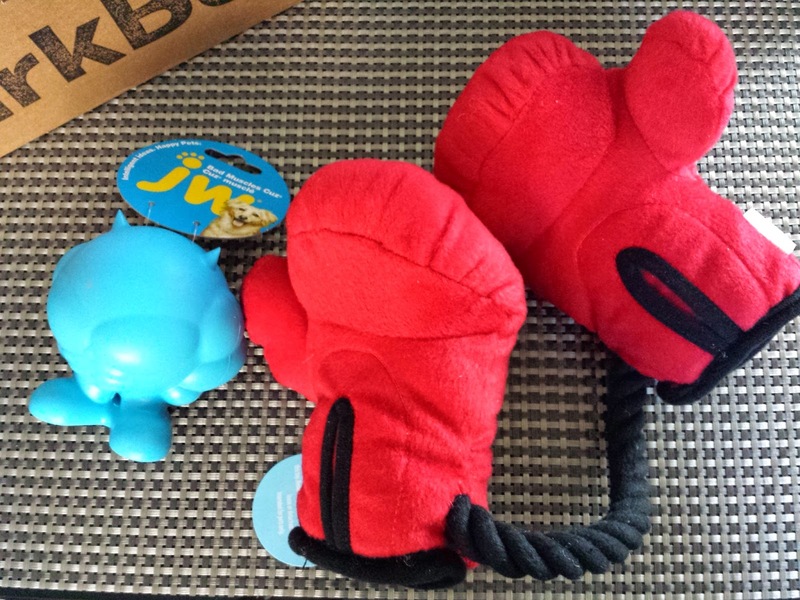 Fabdog Boxing Gloves (Value: $16) - A bit overpriced, but these gloves are effin' adorable. I'm positive that these plush boxing gloves will not stand up to either of my dogs, but I almost don't care because I want to hang it over my rear view mirror like grossly oversized dice. This is a BarkBox exclusive (every box for almost the past year has had at least one exclusive toy) that you can't find anywhere else. Green Bark Gummies Health and Vitality (Value: $6) - As a kid who was is in love with gummy candy, I'm pretty darn excited for my dogs to have these. And surprisingly, it is pretty gummy - while being meaty at the same time. These are made of duck and enriched with chia, a great source of omega-3 fatty acids. There's also chlorophyll from kelp and alfalfa to help freshen breath. My dogs could SO use this. No Grainers Peanut Butter Pleasers (Value: $7) - For the first year of his life, the only table food we ever gave Macho were apples and pineapples. It wasn't until we switched to a new heartworm/flea medication that he got a taste for peanut butter. He refused to take the pill unless it was with PB. It's like he talked to the neighborhood dogs and they told him not to accept anything yucky unless it came wrapped in peanutty goodness. Spoiled brat. So now he gets a spoonful each month with his meds, and he's since learned to love anything PB-related. And by default, Pebbles got to eat PB from the get-go because Macho passed on his wisdom to her. Dogs win, humans lose. These are soft grain-free treats that the fur-dorks will undoubtedly love. It's their two favorite treat traits wrapped into one - meaty and peanut buttery. Etta Says Elk Chew (Value: $3) - I don't know what makes these things so appealing to dogs, but my furbutts have loved every single one we've gotten, including rabbit, duck, and bison. These are crunchy sticks that don't even last two minutes with my pups. I'd imagine they're pretty messy but I've never seen a mess since my dogs manage to lick up each crumb every.single.time. That's how much they love this. 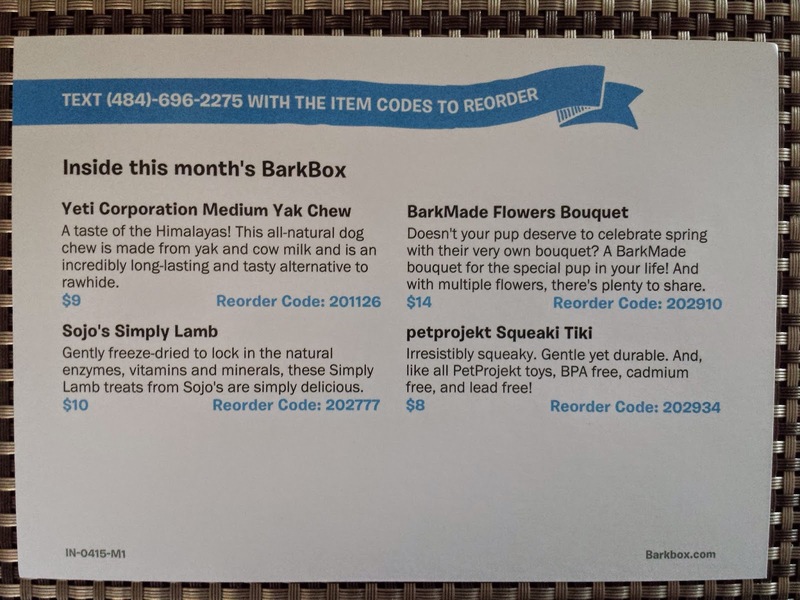 I'm not sure if it's because this was a new subscription, but we got a different curation for our second Barkbox. 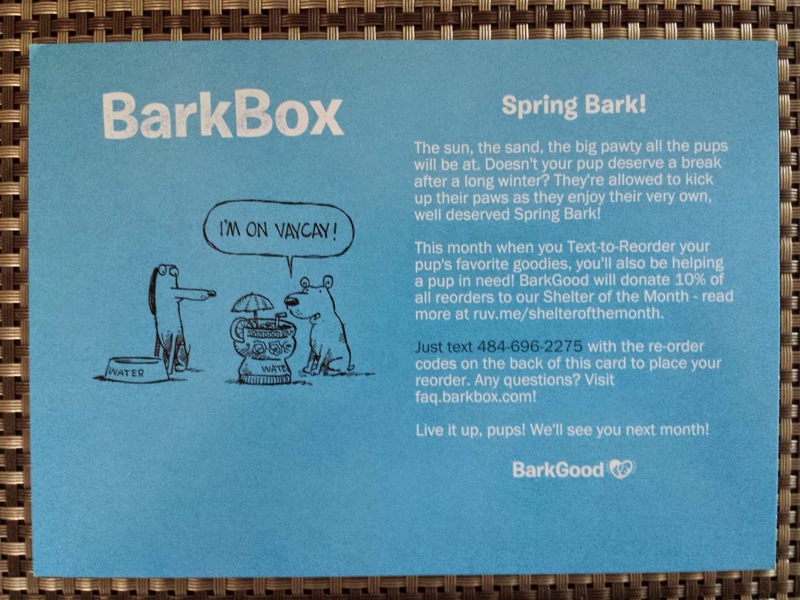 Like the first box, this one is for a medium dog, but the this box's theme is "Spring Bark." Sounds like a March theme to me, but last month's medium box was "Island Paradise" so it can't be. Plus isn't spring break normally in March? Hmm. One of the items is similar to a March item, after all. Oh well, there's no repeats so I don't mind. 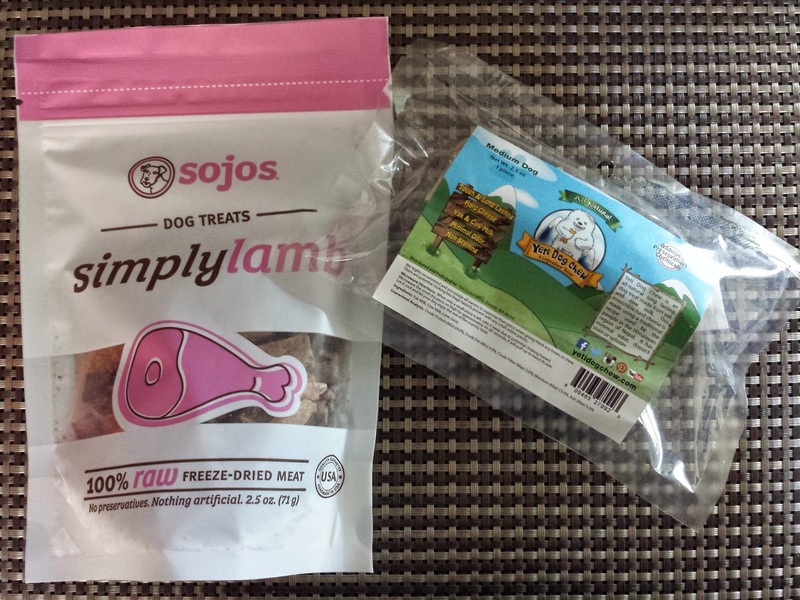 Sojos Simply Lamb (Value: $10) - Sojos is a new brand for us. They specialize in raw dog food - in kibble form, a.k.a. freeze-dried. Reconstitute with water and voila! you have raw, meaty food. Up until a month ago I thought Macho hated lamb; he refused to eat his lamb-flavored kibble when he was a puppy so I gave everything lamb away. 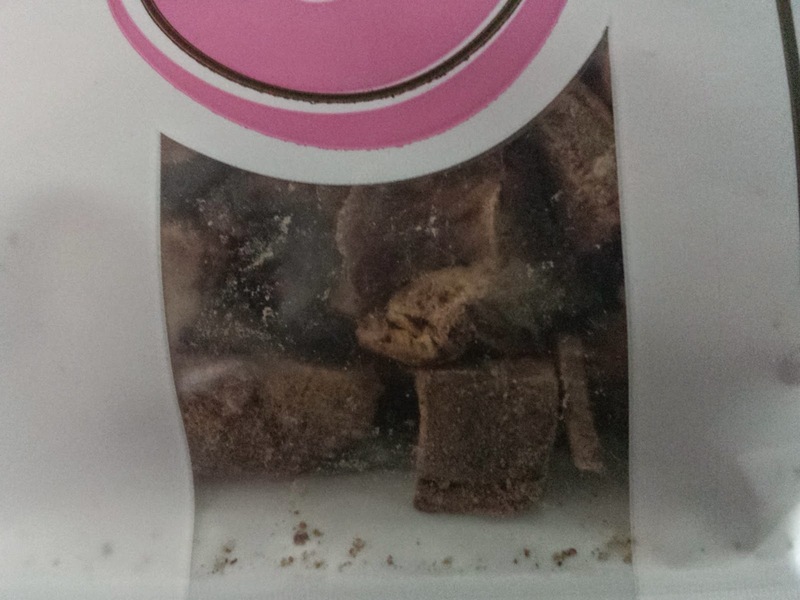 Then last month we bought a bag of lamb kibble again because our usual was sold out. Turns out now he loves it as much as any other flavor. Freeze-dried treats were the only dry treats Macho would do anything for when he was a puppy so I have no doubt he will love these too. 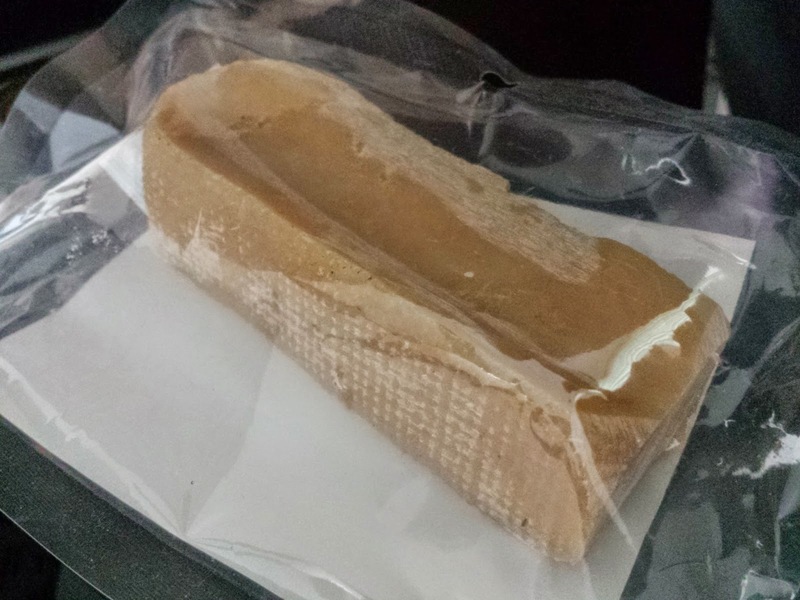 Yeti Corp Yak Chew - for Medium Dogs (Value: $9) - It's a Himalayan dog chew! These are made of cow and yak milk. I always see this at the pet store but never pick it up because it's sooo expensive. Last month we received the nugget version of this but the instructions stressed that it needed to be microwaved to cracker-like consistency prior to serving. Thinking back, I think that was because the nuggets were choking hazards due to their small size and density. This one's about 5" long so my dogs should be safe for a while. Himalayan chews are supposed to be very long-lasting and I'm excited to test that with my power chewers. Pet Projekt Squeeki Tiki (Value: $8) - Pet Projekt is one of two brands I can think of that have proven themselves to me in terms of durability. Macho's not too bad, but Pebbles will find a way to annihilate virtually every Ultimate Kong or "indestructible" thermoplastic rubber toy. She finally met her match with Pet Projekt. A lot of their toys are interactive, i.e. treat-dispensing, so it keeps her occupied for a while. 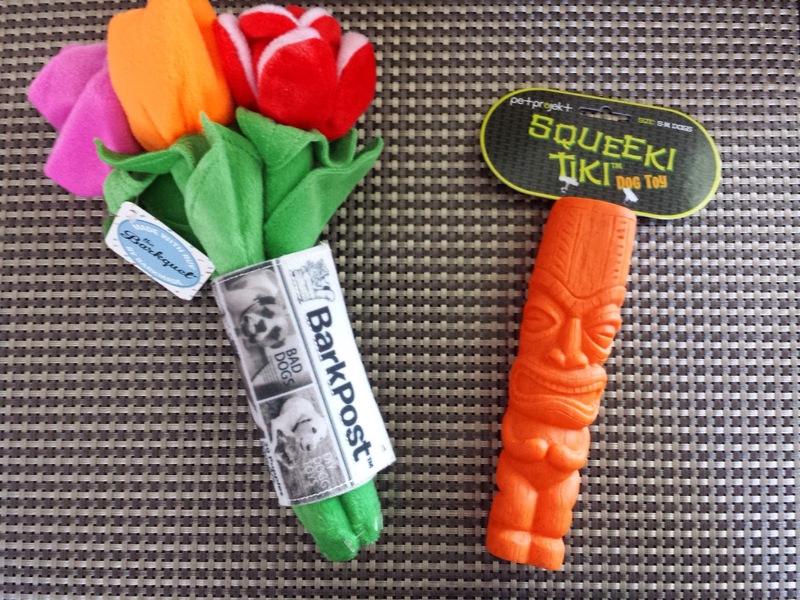 Squeeki Tiki is a squeaky toy (duh), but it's probably the softest rubber toy we've gotten from them. Pebbles will rip this apart in minutes so I'll probably pass this along to a dog that doesn't remind me of a hungry gremlin. I do love both boxes this month, but I think I'm gonna have to say the probably-not-April new sub box takes the win because of the Himalayan chew. AND THE FLOWERS. In all honesty I think the only toy that will last longer than a day in our house is the JW Pet Cuz. JW is the only other toy brand I can think of (besides Pet Projekt) that will stand up to Pebbles' jaws. And their products are very affordable so yay, brownie points for them! I'm also very pleased with the treat selections this month too. 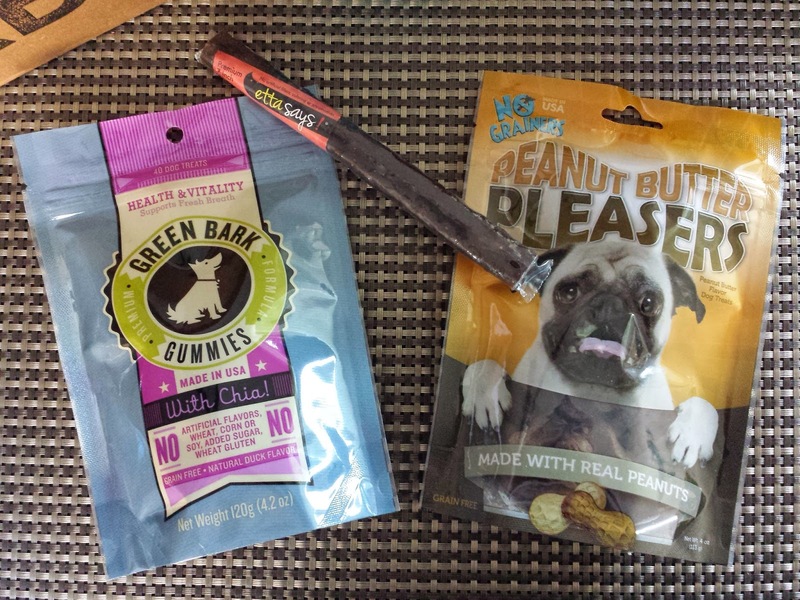 PB, gummies, freeze-dried food, and long-lasting chews. I can't find anything to complain about. I'm a happy dog mom. BECAUSE FLOWERS. If this is your first time hearing of BarkBox, I hope now you have a good idea of what to expect. You'll usually get 2 toys and 2-3 treats every month. Most of the toys are BarkBox exclusives so you won't be able to get them anywhere else. However, I've noticed lately that while I'd rate the toys a 10 in terms of cuteness, they're not very durable. Most are plush, and if your dog is like mine and thinks the idea of a stuffed animal is to remove the stuffing, then you won't get as much out of them as you'd like. 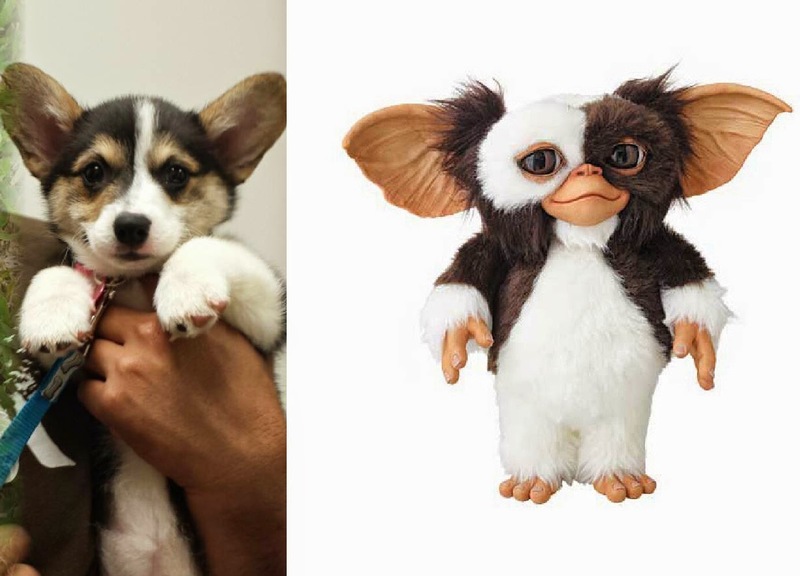 But BarkBox has a Scout's Honor program in which you can choose a toy better suited to your pup if you're unsatisfied with what was sent to you (and you get to keep the original toy too!). Interested in starting a subscription? You can sign up here for as low as $18/month -- plus get a free box tacked on to your subscription just for using my link! WHaaat?! I need a medium dog box!! That one is amazing! Yes, those himalayan dog chews are so expensive! But they last SUCH a long time here. And when it gets down to the nub, I pop it in the microwave. It puffs up and then you don't have to worry about them swallowing a chunk and it getting stuck since it's basically puffy air at that point. Know what else is weird? And I wonder... Maybe your gloves and JW toy are bigger than mine because yours have different (higher) prices than the ones I got. I'm so glad to hear the himalayan chews really do last a long time because I am SO ready for them to stop horseplaying (ie, barking) for just a few minutes...if I can get them to stop for a whole hour I'd be in heaven. These gloves actually are pretty big; just one side is bigger than Pebbles' head. But I'm still scared they'll rip it apart. How are yours holding up to your dogs? Still intact?